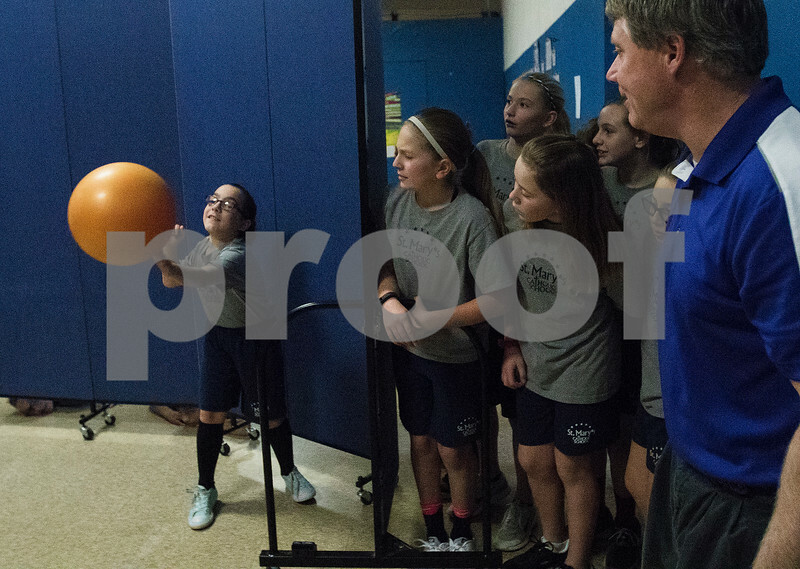 Fifth grade student Mimi Heinisch, left, reaches to hit the large orange ball as classmates who had previously been pegged out watch from around the rolling dividers during a game called "Ga-Ga ball" in their physical education class during school on Monday, Jan. 30, 2017 at St. Mary School in Sycamore. The Israeli dodgeball game translates from Hebrew as "touch-touch". This week is Catholic Schools Week, and local schools are celebrating with special activities and programs. This week is Catholic Schools Week, and local schools are celebrating with special activities and programs.